Add a hint of style to your kitchen with our range of striking glass kettles. Each boasting a sleek, attractive design with an array of high performance features, any kettle out of this collection will make the perfect centrepiece to your worktop. 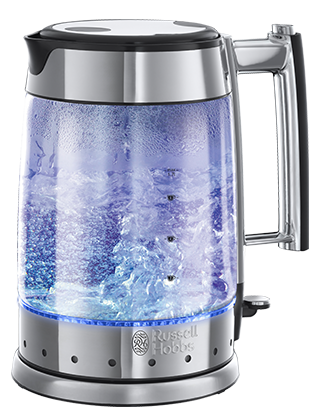 The Russell Hobbs Illuminating Glass kettle is available in a range of colours. The white and stainless steel exterior will sit prominently within a light, contemporary kitchen. The attractive, boil-up illumination will add an eye-catching pop of colour when in use and will truly be a work of art for your work top. Striking, durable and finished with a beautiful stainless steel, this illuminating glass kettle in black will stand out for all of the right reasons on your kitchen worktop. 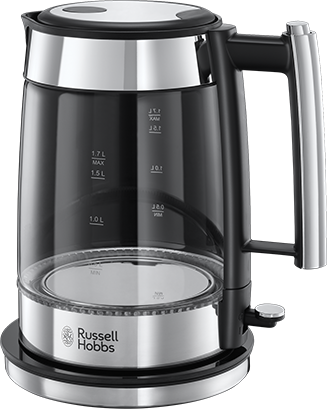 The premium glass body allows you to see how much water you’re using, without having to boil more than you need and it also has a concealed element which keeps the kettle looking spotless. As we continue to embrace the copper trend, we have designed this stylish kettle which will make the perfect addition for any leading-edge kitchen. Stylish and practical, this kettle saves up to 66% energy when in use and has a 1.7 litre capacity meaning it can handle the whole family’s tea round. 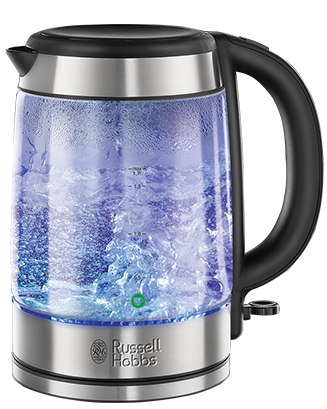 This futuristic yet timeless kettle has been ergonomically designed with a premium Schott glass housing, an easy grip soft grip handle and a Perfect Pour spout to ensure the water goes into your cup without splashing over your work surfaces and it sits on a 360° base so it can be comfortably used by right and left-handed people. This classically chic and modern kettle brings ultimate class to your kitchen. Whether you have a traditional or contemporary kitchen, its intense black, steel grey and glass viewing window gives it a sophisticated and trendy look which can be perfectly adapted to any style of kitchen. 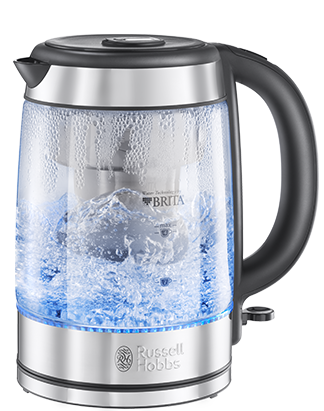 We’ve added a built-in Brita water filter system to one of our beautiful glass kettles. The Brita filter reduces limescale and chlorine, and permanently absorbs any copper and lead that could occur in tap water, ensuring your water is the purest it can be.